In addition to the ability to view the Twitter streams of people that you follow, Twitter has added a new button on the Following page that allows you to shuffle through the Twitter streams of your followers. This should make for an interesting way to stumble upon interesting Tweeters that your followers like. 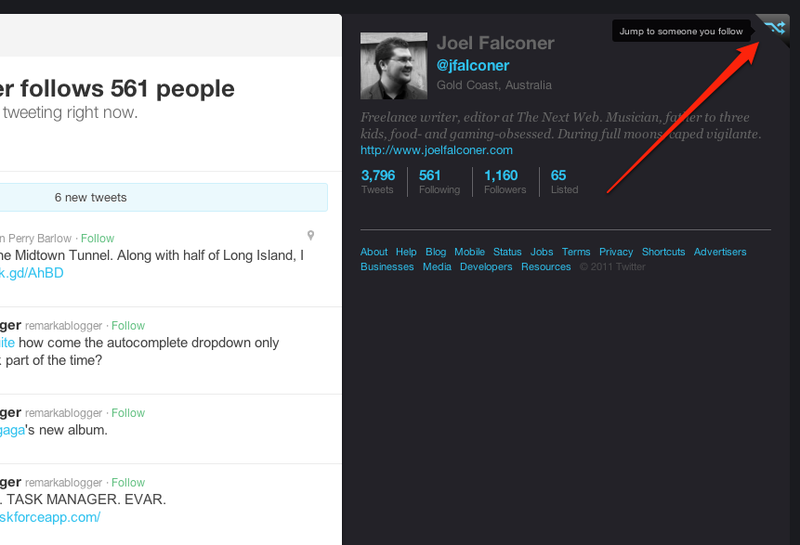 When you hover over the button it tells you that you’re able to jump to another one of your followers. Clicking it zips you over to a random person that you follow and shows you your stream. This could be an effort by Twitter to aid people in discovering new followers, catching up on news that’s interesting in your follower’s world or simply to give you something to do when you’re bored. Thanks to David Purser for pointing this new feature out to us. Do you think that you will find yourself using the new ‘jump to profile’ button?